Harrogate Town will begin their first ever National League campaign with a home clash against Sutton United at the CNG Stadium on Saturday, August 4. The U’s, who also play on a 3G pitch, should provide a stern test first up having narrowly missed out on promotion to the Football League at the end of last season, losing out to Boreham Wood in their play-off semi-final showdown. Simon Weaver’s team’s second fixture, and first away trip of 2018/19, will see them travel to Hartlepool United on Tuesday, August 7. A trip to Bromley (August 11), a midweek home clash with Barnet (August 14) and visit to Aldershot Town (August 18) make up the club’s first five fixtures. 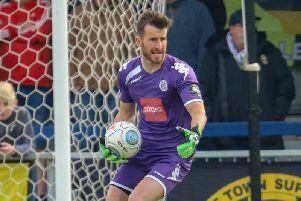 This season’s Boxing Day clash pits Town against Halifax on Wednesday, December 26, before they head to The Shay for the return match a few days later on January 1, with AFC Fylde visiting Wetherby Road in between on Saturday, December 29. The first Bank Holiday encounter of the camapign will see Weaver and his men visit Fylde on Monday, August 27, while Good Friday brings a trip to Leyton Orient, followed by Gateshead at home on Easter Monday. Town’s final National League fixture of the season takes place on Saturday, April 27, when the Sulphurites travel to Wrexham. Other notable fixtures include Leyton Orient at home (September 22), Chesterfield at home (November 3) and their longest away excursion at Dover Athletic away (February 9).